It’s an easy thing to forget when you’re building a website: people find stuff using search engines. Most of the the time they won’t remember the name of your website and decide to go there. They’ll look something up on Google or one of the miriad other search engines and it will haphazardly lead them to something on the web, useful or not. We’d all like to think that the website we’re making is so important and so useful that people will remember the name of it, bookmark it and come back to it regularly, but chances are that just isn’t the case. In my last post I described the early stages of building PlanningAlerts and how the website was focused purely on getting people to sign up for email alerts and how, surprise surprise, the traffic was pretty small after launch. Since this post is about searching you probably have some ideas where this is going, but I’ll digress a little further. There’s a lot to be learned from past experience. Looking at the statistics of visitors to OpenAustralia.org while parliament is in session we get about 75% of our traffic through search engines, and of that about 50% is coming from normal searches on Google and 25% from “paid” searches on Google (we get advertising donated by Google through their Google Grants programme) and then a small sliver from other search engines. From my understanding these numbers are fairly typical of a large site. Another interesting thing about the OpenAustralia.org traffic is that it varies hugely between the times that parliament is in session and when it’s in recess. A large part of this is because people don’t receive email alerts when parliament is in recess. Email alerts are the way that people are reminded that there is something interesting to look at and so it’s one of the really important ways that people keep coming back to OpenAustralia. So, basically, search is what largely brings people to OpenAustralia for the first time, but email alerts are what keep them coming back. So, how can we apply this experience to PlanningAlerts? The answer is surprisingly simple. PlanningAlerts has a database of a huge number of planning applications spread across the country. At the moment we kind of hide this information and only make it available to you if you sign up for an email alert. If we put that information on our website and make it searchable and browseable (and indexable by search engines) we’ll find a whole lot more people will discover PlanningAlerts. So, how did we go about doing this? We’re now also actively telling search engines about those pages using sitemaps. So, every time new planning applications are found on council websites (which are usually not indexed by search engines) they’re indexed by the search engines as quickly as possible. We’re already now seeing that the majority of searches that lead people to find PlanningAlerts are coming from people doing searches on specific street addresses. This shows that it’s working. 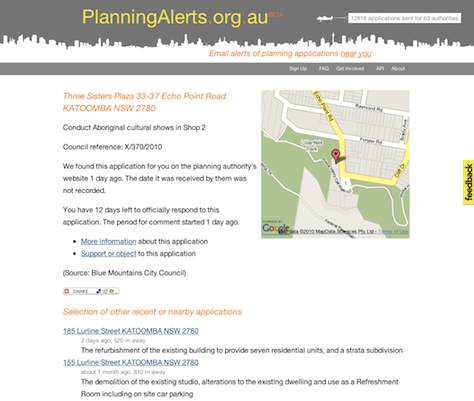 This entry was posted in Development and tagged building PlanningAlerts, search engines. Bookmark the permalink. Post a comment or leave a trackback: Trackback URL.